A new field of dreams has officially opened in Murfreesboro. 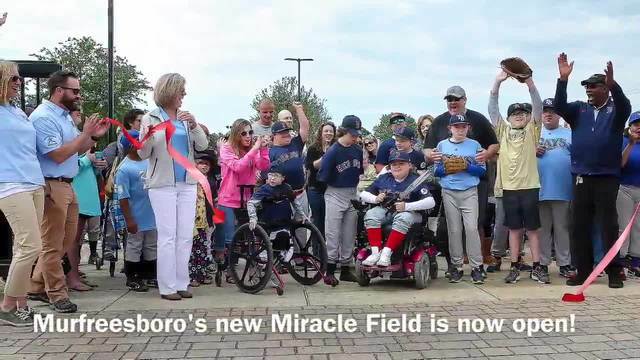 The Murfreesboro Miracle Field in McKnight Park was custom-designed as a baseball field built for children and adults with special needs. In addition to the baseball and softball field, there’s also a playground, concessions building, and covered seating. The special rubberized field also accommodates wheelchairs and other assertive devices. According to reports, the fundraising for the $3.2 million project was spearheaded by the Project One Four Foundation. “We are extremely grateful for the work of the Project One Four Foundation in partnering with the City of Murfreesboro and support from organizations such as the Christy Houston Foundation to bring Miracle Field to our community,” said Mayor Shane McFarland. Major League Baseball star David Price and city officials came together for the opening ceremony on Saturday. Price was a standout pitcher for Blackman High School and Vanderbilt University. He was also a Cy Young Award winner in 2012 for Tampa Bay. The Miracle League can also be found in Tampa Bay where Price participated with the league on Saturday mornings. He said he enjoyed seeing the excitement of the children and their parents. “Being a father is something I always cherished and wanted to do,” Price said. On Saturday, three one-inning games were also held between the Miracle League's first six teams.